This page is dedicated to Bass Biology and Behavior. It will also discuss their Environment and Habitat. March 1,2000 An article in TIME magazine told of an important discovery in fish Biology. The article concerns Atlantic salmon but has potential for Bass Biology as well. It appears that scientists can splice a gene into salmon that can allow the fish to grow twice as fast, resist disease and outmate its competitors. They found that when they stitched a portion of a gene that allows polar fish to keep from freezing into a salmon's growth hormone gene, it greatly speeded the fishes growth and development. It grows up to 5 or 6 times as fast in early months and twice as fast overall. Just Imagine if we can get them to try this on Bass. The two fish in this picture are exactly the same age. 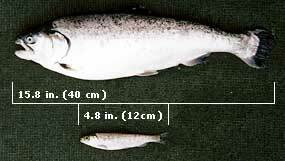 They came from the same female egg mass and fertilized by the same Buck salmon. The top fish had his growth gene spliced into its egg. Click HERE to read the TIME article. Scientists are also doing this on Trout, Carp, Catfish and Shrimp. These experiments are for allowing Fish Farmers to double production for food. Currently, all fish experimented on are contained. But, critics are concerned that they may escape ( in floods)and breed with native fish and upset the balance of nature. So far, The FDA has not approved the introduction of these fish into the US. These experiments currently being done in Canada.